Office disputes here at ThinkGeek are handled in a most diplomatic manner. As standard procedure, the offending parties are teleported to the surface of Vulcan where they duel to the death to resolve their differences. However due to the high employee turnover rate we have revised the policy to declare a victor based on Palmzsize Battle Tank warfare. 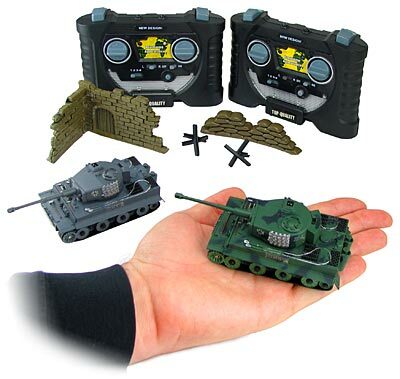 These detailed diminutive r/c tanks feature authentic tank sounds and IR based "laser tag" action with realistic recoil. A hit momentarily disables your opponent. Get enough hits and take control of your enemy's tank. Each set contains two-tanks, but buy an extra set and up to four tanks can battle at once to solve those more complicated office disagreements. We know you read directions... but just in case you don't, please realize that each tank can be set to any of four channels. But they must be set up in turn before the battle begins. Turn on your tank, turn on the remote. The tank's light should be flashing red. Push the small round button just below the "on/off" switch on the remote. The tanks light now turns solid green. It is now set to the correct channel. Repeat this procedure for each tank. If you turn the tank off, you will have to set the channel again. On the front of each tank, next to the indicator LED light is a small button. Push this button after the tank's channel has been set and you can toggle between two battle modes. 5 hits by the enemy and they take control of your tank. Your tank now behaves as if it is set to the same channel as your opponent's tank. Your opponent can drive and fire your tank. This is obviously most useful when 3 or 4 tanks battle.